Another great product from OrtoCori, these sweet onions are part of their Grilled Specialties collection. These grilled whole onions can be great as antipasto, especially with cold cuts. They can also be a salad ingredient, or contorno to meat dishes or fried foods. Imported all the way from the Lazio region, one jar contains small sweet Borettana onions, which are native to the Emilia-Romagna region. Yellow bulbs with small thin skins but firm tasty flesh, these Borettana onions are first grilled in a wood-burning fire. After that, they are marinated in a special blend of oils herbs, some natural acids, and wine vinegar. 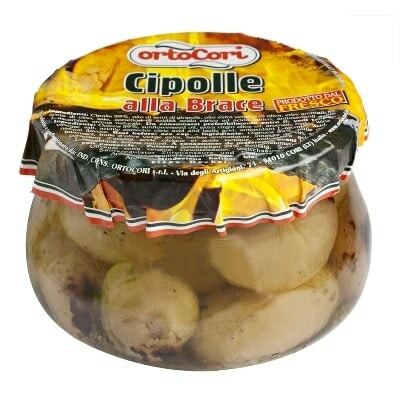 If you’re looking for something uniquely savory and sweet, then this jar of OrtoCori Cipolle alla Brace may just be what you need.